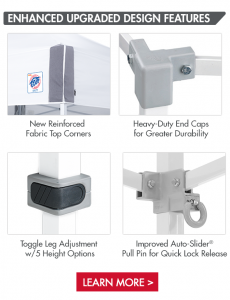 Do you need a sturdy, dependable, customizable tent for farmer’s markets, fairs, and shows? Look no further. 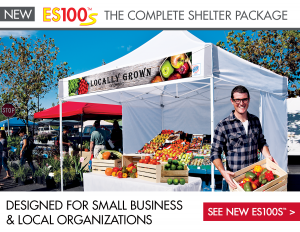 ABR Print is teaming up with E-Z UP to provide your business or non-profit the tent that will meet your organization’s needs. These tents start at just $300 and are available in many sizes. The sizes start at 10×10, so smaller events with limited space are no problem at all. 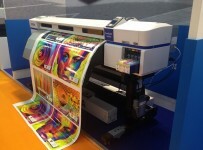 In addition, a full-color banner can be added in order to represent your company or non-profit. This banner will attach with Velcro to your tent. This tent sets up quickly, and is sturdy and dependable. Whatever the weather, this tent will provide shelter and shade for you, your employees, and your wares. These tents are designed with small businesses and non-profits in mind. 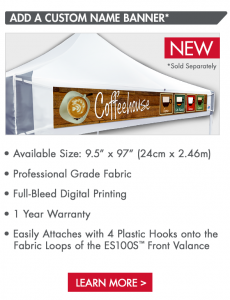 If you have been selling and promoting out of a vehicle, with a bare table, or with any other tent, or if your organization visits many festivals, fairs and events, this tent is for you. Don’t let this opportunity pass your organization by. 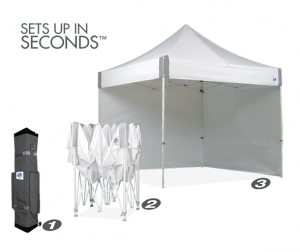 Make sure to call ABR Print today to place your order for the E-Z UP tent. If you don’t have a logo to have printed on your banner, the talented crew at ABR Print can custom design one just for your organization. Need promotional items to hand out at your new tent? ABR Print can help you there, as well. Oh, and don’t forget about the business cards!